Attic Mold Removal in PA- Professional, Guaranteed. Your Eastern PA attic can be hiding a serious mold problem, but you may not even notice it. Conditions like excessive heat, high humidity, or roof leaks can provide enough water to cause and sustain mold growth. Attics tend to suffer from ventilation and insulation problems. These problems can obstruct air circulation and allow moisture buildup. Moisture buildup in the attic is very easy to overlook since you typically do not spend all that much time in your attic. If you discover potential attic mold development in your home or business and the property is located in Philadelphia or in one of its surrounding counties, we can help. Mastertech’s attic mold removal professionals in Eastern PA can identify if your attic has a mold problem and develop a safe and effective attic mold removal solution. Once your attic is clean and safe, we’ll make recommendations for preventing mold from returning in the future. What causes attic mold in Eastern PA? Aside from the obvious roof leak, moisture buildup in the attic can easily go unnoticed. As hot air rises in your property, it collects in your attic. If an attic is not properly ventilated, it can be very vulnerable to excessive moisture buildup. Warm air in the attic can lead to condensation and elevated humidity. What are the Risks with Mold? Indoor mold development can mean potential health implications that can range from mild allergies to severe upper respiratory problems. Mold effects each person differently. It all depends on the individual, the species of mold, the length of exposure, and several other factors. In addition to potential health problems, living in a home with mold is simply unsafe due to the underlying water problems. Mold and water damage can eat away at your building materials and seriously compromise the structural integrity of your home. That is why an attic mold removal plan will ALWAYS include moisture control tactics to prevent future problems. Visual Assessment– Your MasterTech Inspector will complete a comprehensive visual analysis of your PA attic to identify any conditions that could be causing and sustaining mold growth. You will have access to all digital documentation from our inspector for your records. The attic mold removal experts at MasterTech of Eastern Pennsylvania are thoroughly trained and equipped with the necessary knowledge, skills, and tools to safely address your attic mold removal needs. Your Mastertech mold inspector will develop the safest and most efficient scope of work that properly addresses your specific mold problems. This will ensure that your attic mold is properly removed and prevent future recurrence. 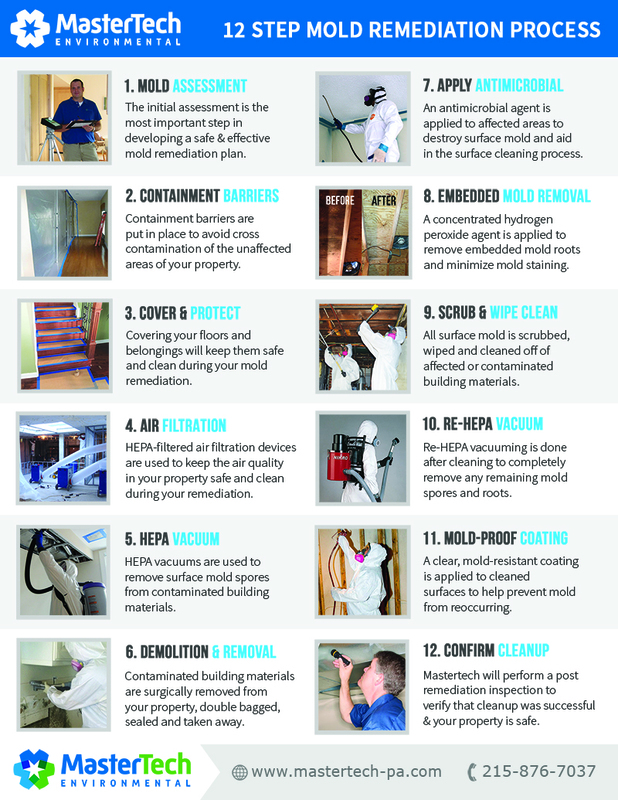 Call 1 (215) 876-7037 today to learn more about attic mold removal services Eastern Pennsylvania. We will be happy to answer all your questions and schedule you for an appointment with one of our certified professional mold inspectors.